One of the key historic sites in the USA associated with the Manhattan Project of developing the first nuclear weapons during WWII. Hanford was the remote site on the Columbia River in Washington State that was chosen for the world's first large-scale nuclear reactor. It produced the plutonium for both the first atomic bomb of the Trinity Test as well as for the bomb dropped on Nagasaki. During the Cold War, Hanford was greatly expanded and became the plant that produced the plutonium for most of the vast nuclear arsenal that the USA amassed in that era. Over the years of its operation, Hanford became the most radioactively contaminated place in America. Today the site is undergoing a massive clean-up programme and most of the old facilities have been dismantled and demolished in the process, but the historic B Reactor is still standing and can be visited. More background info: See also under Los Alamos, Trinity, Nagasaki, Manhattan Project and National Museum of Nuclear Science & History. As the Manhattan Project got under way in 1942, a remote and large enough tract of land was needed for a facility for plutonium production. It was to be a good distance from any larger town, railway or other important bit of infrastructure. And it should also be as far away as possible from the other sites of the Manhattan Project, especially from the already existing uranium production facility at Oak Ridge, Tennessee. A reliable and abundant water supply was another key requirement. The scouts sent out to track down such a location eventually found it at Hanford Reach, Washington State, a very remote arid stretch of land adjacent to the Columbia River, the Pacific North-West's principal river. The only problem was that the territory wasn't quite uninhabited. And so a few hundred farmers and settlers from two small towns/villages as well as some Native American tribespeople had to be evicted from the land before the first phase of construction began in 1943. Some ruins of the previous settlements can still be found today, such as the former High School building of Hanford. Between 20,000 and 60,000 workers gathered at the site to undertake the colossal building project, and to house all that personnel special construction camps were set up. Further south the purpose-built town of Richland was created as the site's administrative and research centre – another secret “Atomic City” (like Los Alamos in New Mexico, the main research facility for the project). The core of the Hanford Project was the B Reactor, the first large-scale plutonium producing reactor in the world. It was based on an experimental design by Enrico Fermi devised at the University of Chicago, but on a much more massive scale. It was a ca. 250 megawatts, graphite-moderated, water-cooled design with fuel rods inserted horizontally into the core, while control rods were inserted vertically. Construction took over a year but in September 1944 the B Reactor finally went into operation. Two more reactors (D and F) of identical design joined B Reactor soon after. The first weapon-grade plutonium produced at Hanford was then transferred to Los Alamos in early 1945 – and in July it was used in the first ever detonation of an atomic bomb in the Trinity test near Alamogordo, New Mexico. The Atomic Age may have been set off with a bang in the desert in the south, but the origin of the material for this first bang was Hanford in the north-west! All the while the project was kept top secret. Only a small handful of people had full knowledge of what was going on at Hanford. Even at the plant itself, almost all workers, except for a small elite of scientists and engineers (only about 1% of all staff at the site), had any knowledge of the purpose of the whole operation. That only came out after the bombs had been dropped. When the two atomic bombs had done their job and facilitated the unconditional surrender of Japan and thus helped end WWII, the reactors' operation was first suspended. But it soon resumed with the advent of the Cold War looming darkly on the horizon. Hanford was then gradually expanded and became the largest plutonium factory in the (Western) world. Eventually, a total of nine reactors running in parallel supplied virtually all the plutonium for the USA's nuclear arsenal up to the early 1970s. The historic B Reactor was shut down in 1968, after four of the others had already ceased production between 1964 and 1967. Three of the remaining reactors were then shut down over the next three years, leaving only the N Reactor, which had joined the set late in 1963, to continue running (mostly for generating electricity commercially). N Reactor was finally shut down too in 1987. In the decades of the plant's operation it had turned into the most radioactively contaminated area in the western hemisphere – only Mayak in the former USSR, now Russia, is more polluted. There are vast amounts of radioactive waste buried at Hanford, or rather: stored in underground tanks, mostly. The waste management and clean-up operations that set in after the plant was shut down are still ongoing. With the exception of B Reactor, all the old reactors were “cocooned”, i.e. demolished except for the concrete inner shield around the reactor cores, which were then entombed in a new outer shield building. Most of the ancillary buildings and processing plants were also demolished and the material buried. Hence the site at Hanford is now mostly an empty plain with only a few remaining structures standing above ground. What there is to see: not much unless you're on a tour. When I was there in August 2015 I could not go on a tour and thus had to make do with viewing the remainder of the site, especially the hulk of the old B Reactor, from a distance, namely from Highway 24, which runs past the site to the west and north. By the road just to the east of the bridge that takes HWY 24 across the Columbia River, there is a small historical marker and information panel about the site. It provides a brief summary of the historical background and a few black-and-white photos … the panel is tarnished by what looked to me like bullet holes that somebody must have shot through it (why anybody would do that is beyond me). The location is also one of the best spots from where to see the old B Reactor from outside the Hanford site's perimeter fence. You can also spot the “entombed” shell of the former C Reactor just behind B Reactor as well as the odd lower ancillary or former farm building. But that's it. When I was there, the view was impaired by the smoke from the forest fires that were raging at the time in the north of Washington State. In fact these wildfires in the summer of 2015 were the worst in the state's living history. Thousands of people had to be evacuated from their homes. Several firefighters lost their lives battling the blaze. Hence the US flag was flying at half mast in many places I saw at the time in the area. 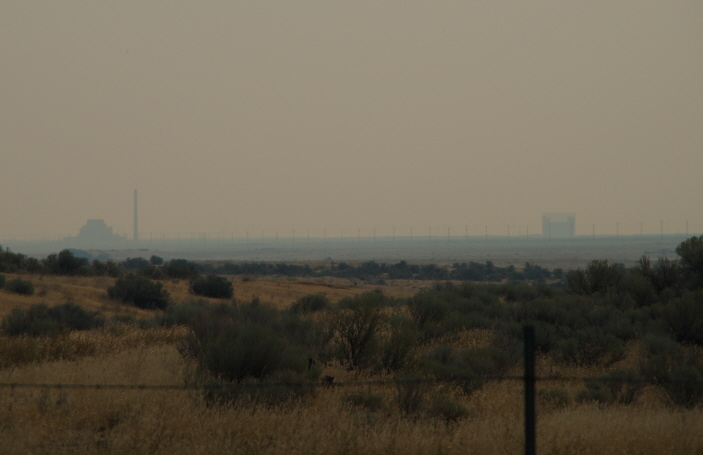 And even at Hanford, nearly a hundred miles (150 km) south of where the fires were actually raging, the air was still thick with an eerie yellowy haze – and you could smell wood-fire smoke! what little I could get out of going there in the first place. Unfortunately I had not yet learned about the possibility of non-US citizens being allowed on tours of the historic B Reactor, and hence hadn't even attempted to sign up for a place on one of them (if they were even running at the time; given the bad air quality, I could well imagine that tours of the site were suspended for the duration of the wildfire crisis). There are even tours of the larger area of the whole site, including the ruins of the former school building in what used to be the village of Hanford before the civilian population was evicted. You can also see some of the waste storage/treatment facilities and the sites of yet more former reactors (now mostly “cocooned”). HOWEVER, these more extensive tours are still restricted to US citizens only. No foreigners are allowed to partake in them. Shame. Location: on the Hanford Reach part of the Columbia River in south central Washington State, USA, ca. 150 miles (250 km) south-east of Seattle as the crow flies. Details: Formerly the site was completely out of bounds, but then the Department of Energy started allowing members of the public to go on tours of the historic site. Initially these were, however, categorically restricted to US citizens only. While longer tours of the whole site and the clean-up operations are still restricted to US citizens only, the reactor tours, now entitled “Manhattan Project B Reactor Tours” are no longer subject to this restriction! This is great news for all us non-Americans out there who are nevertheless interested in the subject of the Manhattan Project and its historic sites. And what's more: you are even allowed to bring cameras (both still and video and also including smartphones). You still have to register well in advance to get a place on such a tour. In order to be allowed on the tour you have to sign a disclaimer form. The tour operator assures participants, however, that the site is perfectly safe to visit and that the facility is “vigorously inspected” before each tour. Participants must be a minimum of 12 years old. Under 18-year-olds are required to have a parent/guardian to supervise and sign a special release form for them. The tours run only seasonally. At the time of research (March 2016), no new information about the 2016 season of tours had yet been posted on the Hanford tours' website. Watch this space for updates! Remarkably, participation in the tours is free of charge! If you are not registered for a tour, the only thing you can do is as I did and drive along Highway 24, which is the only road from which to get a decent, though distant, view of the site. From Yakima, HWY 24 branches off to the east from I-82. From Richland in the south HWY 240 connects with HWY 24. Coming from the north from I-90, take either HWY 243 from the eastern side of the bridge at Vantage and approach Hanford from the west, or if coming from the east, work your way down along HWY17 from Moses Lake via Othello or via Highways 395 and 26. In any case, you will have to have your own vehicle to make it there. Public transport is very limited in the area and would at best get you as far as Richland. Time required: not long for just a look from the roadside. If you are allowed on a tour of the historic B Reactor and/or the longer Hanford site tour, then factor in up to 5 hours in total. Plus driving time to get there. 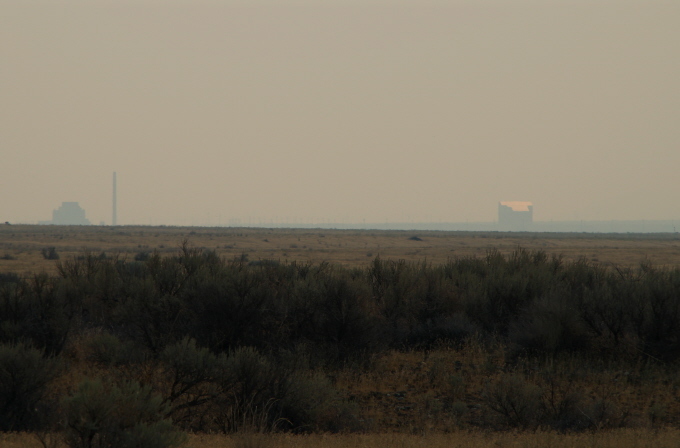 Combinations with other dark destinations: At the south-eastern end of the former Hanford site lies Richland, the “Atomic City” where most of the key personnel who worked at the site were housed. It is thus also of (perhaps secondary) historical interest, though there is little that would indicate the town's nuclear heritage now (cf. Los Alamos) except for the town's thematically related research institutions. For places further afield see under Seattle and Mount St Helens in particular and under USA in general. The other places associated with the Manhattan Project are all a long distance (a thousand miles or more) from Hanford: Los Alamos, Trinity, Chicago or Oak Ridge National Laboratory, Tennessee (the latter being the older uranium production facility equivalent of Hanford – Oak Ridge too can only be visited by US citizens). 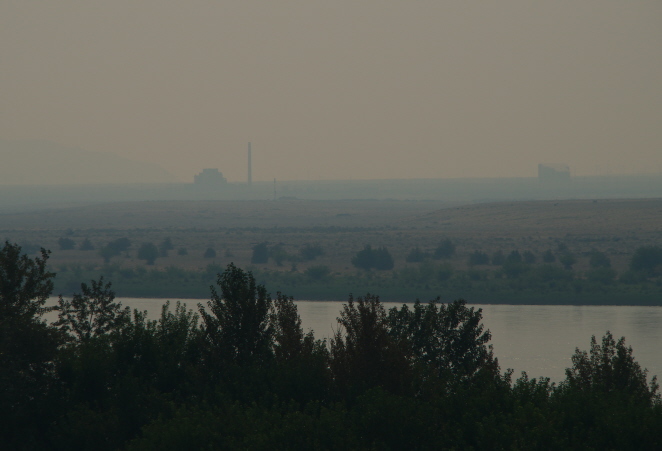 Combinations with non-dark destinations: Directly adjacent to the former nuclear site is the so-called Hanford Reach National Monument, which includes the only free-flowing stretch of the Columbia River and parts of the Columbia River Plateau around it. 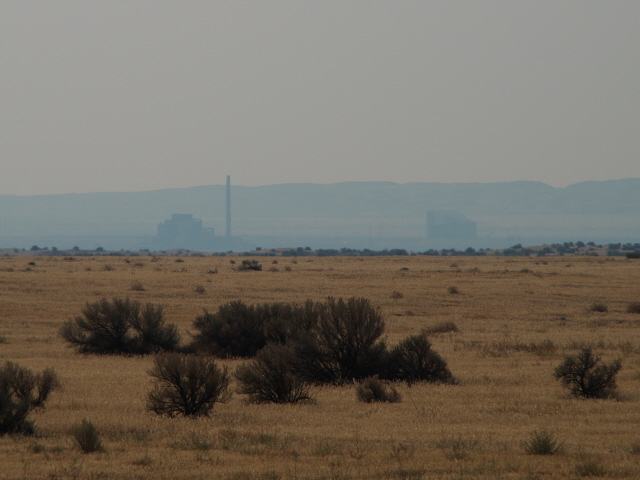 Protected thanks to the former high-security “buffer zone” around the Hanford site, the Hanford Reach area remained largely untouched for many decades. That way several rare species have found refuge here. And despite the proximity of the nearby badly contaminated nuclear site, this part of the river remains one of the prime salmon spawning grounds! It is a very remote, rather barren-looking, dry steppe kind of landscape, but it has its own kind of harsh appeal. Access is permitted to parts of the National Monument, including the river itself (e.g. for canoeing), others remain closed to the public or require special permits. The nearest town to Hanford that is of note, other than Richland, is Yakima, which is well worth a look. It is famous for its rich agricultural heritage. Not only is Yakima Valley one of Washington State's main wine-growing areas, its fruits are also famous. On top of that, Yakima is by far the most significant hop-growing area in the Americas, providing more than three quarters of all the hops grown in the USA. Given this local abundance of hops it is odd that Yakima did not itself have much to do with brewing beer until recently. But this has now changed and the town is catching up on the nationwide craft-beer boom.